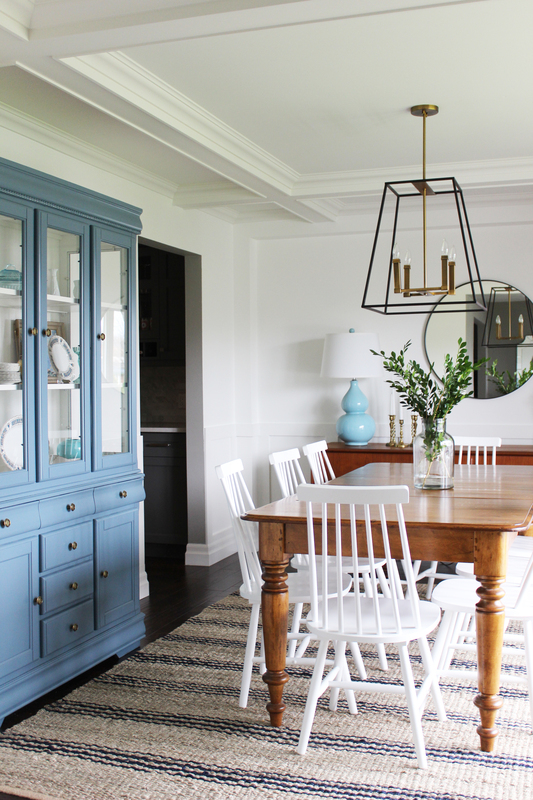 In honour of the Christie Antique Show that is happening tomorrow, I would love to share with you our new dining room and the story behind it! 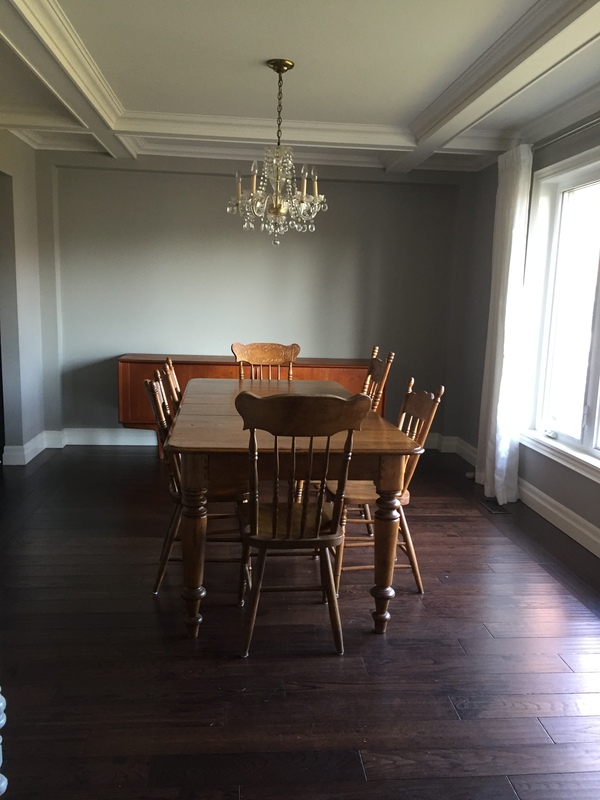 The story of our dining room starts with my dad… he had been looking for a dining room set for me. I would get calls from him that he found a set in the classified ads, I would thank him and let him know that I’ll think about it. I knew I wanted only a table and would work on the other pieces after but he still liked searching for me. Last year he passed away… this time was very difficult. So once he passed, I paused my search. 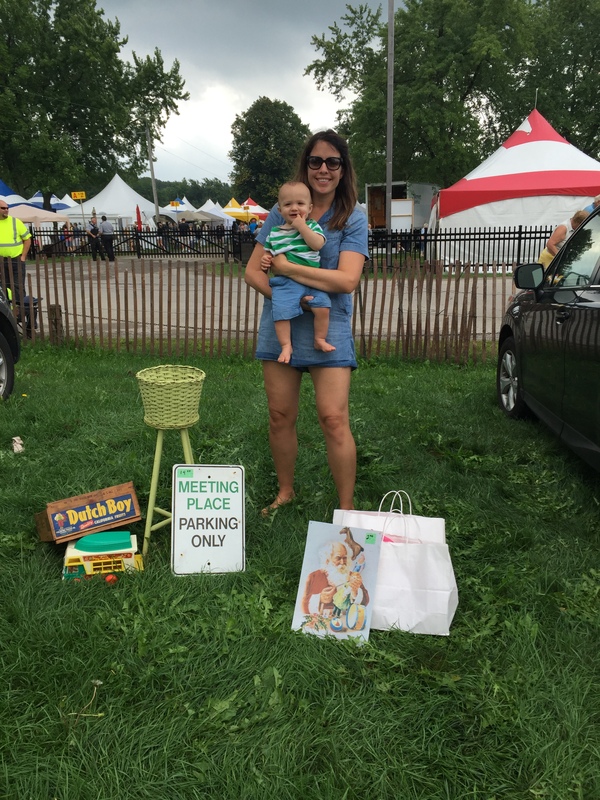 I knew the Christie Antique show was coming up in the fall, I called my mom up to go with me – we went and found the perfect table. I knew I wanted a big table that I could extend if we needed more seats, I didn’t want a dark wood colour and it had to have a story. Well, the story of this table is that it is made from butternut wood, made in the late 1800’s, comes from PEI and the man who was selling it lives out east, in the Maritimes. My dad’s family is from out east so hearing that this table came from PEI and had been around for a long time was exactly what I wanted to hear. My mom was with me and agreed that this table needed to come home with us. There was happy/sad tears while paying for the table because we knew my dad would approve! 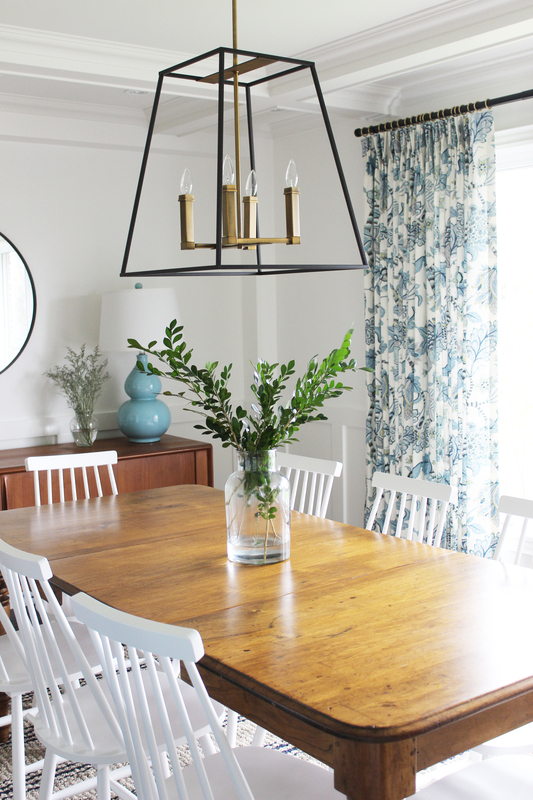 After I bought the table, I found a beautiful teak sideboard and that’s when it started to fall apart… the room wasn’t coming together like I imagined it would. 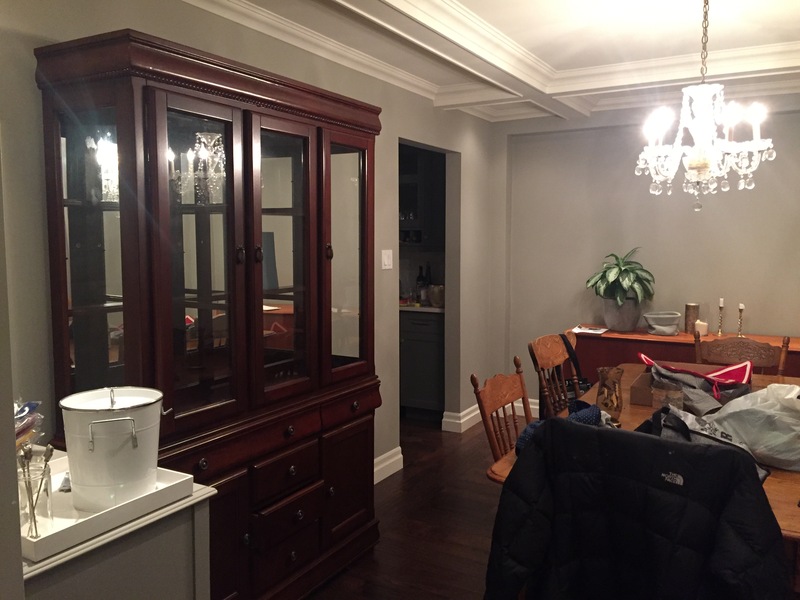 I think I felt more pressure because this was honouring my dad in a way, he was determined to help me pull this dining room together. 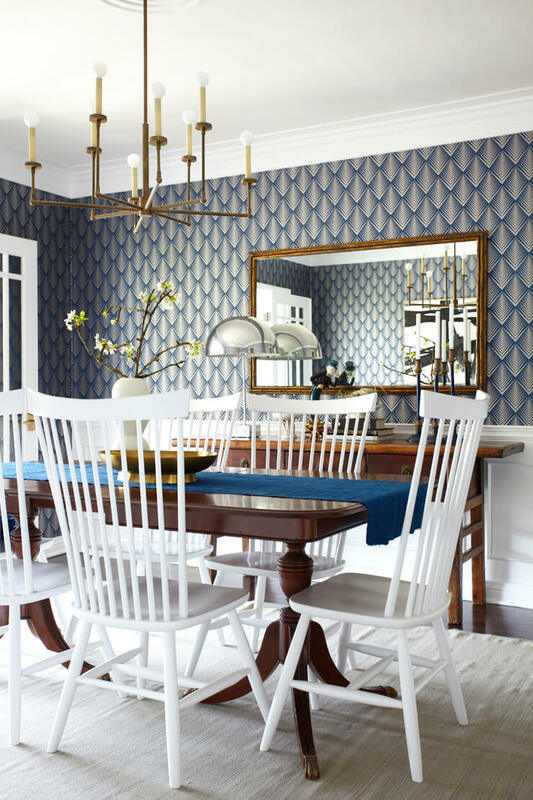 I knew I wanted the same colour chairs but didn’t know what colour, I didn’t know what direction to head in so I contacted the talented interior designer, Tiffany Leigh. I sent her some inspiration pictures that I was leaning towards and left the rest in her hands!! 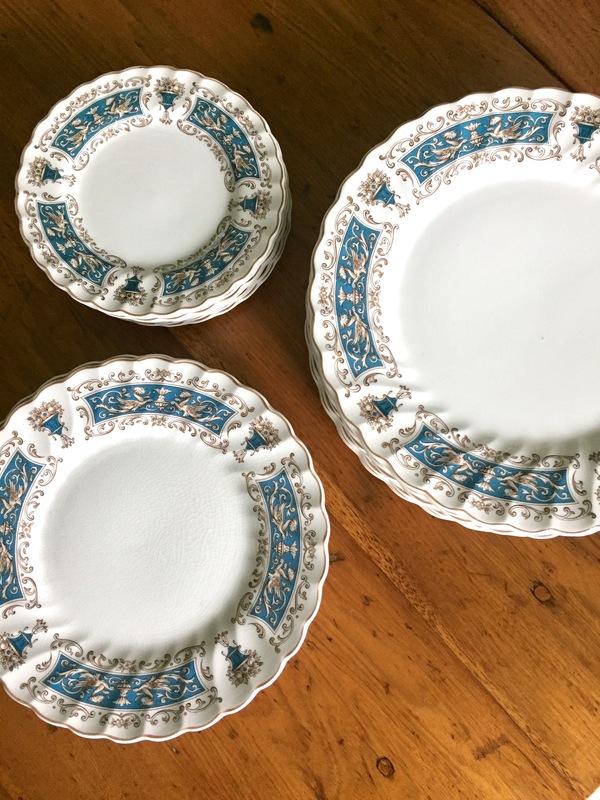 I found a few pictures that appealed to me… I have always loved the work of Sarah Richardson Design and had recently started following Emily Henderson. 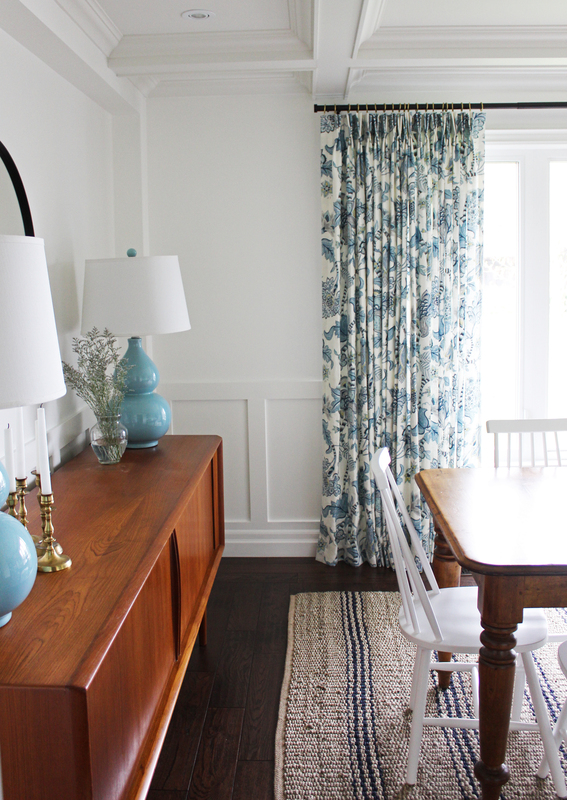 I was inspired by Emily’s use of teak sideboard’s and her love for blue! Tiffany got to work and presented me with what she had in mind for our room and I was thrilled!! She is extremely talented and sweet, I loved working with her on this. She doesn’t know this yet, but I may have to get her to help me with my basement!! 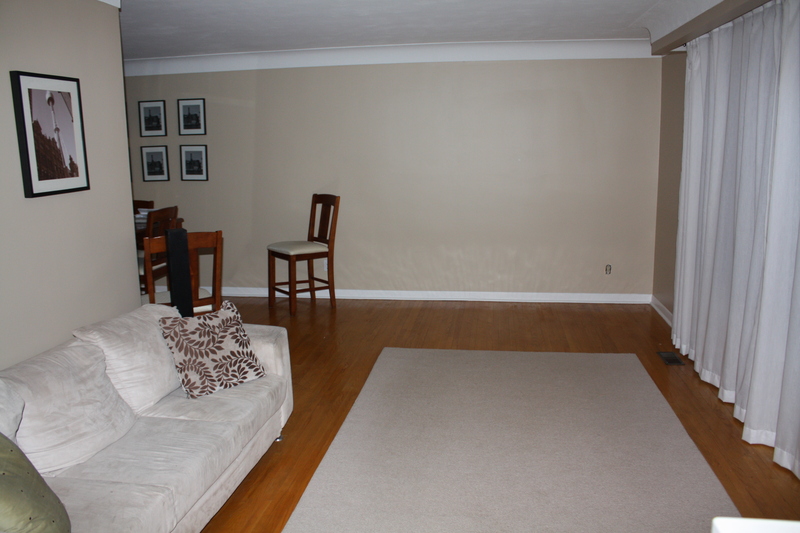 We did some major renovations to the main floor (see kitchen here and living room here), so this is what our dining room space looked like when we moved in. 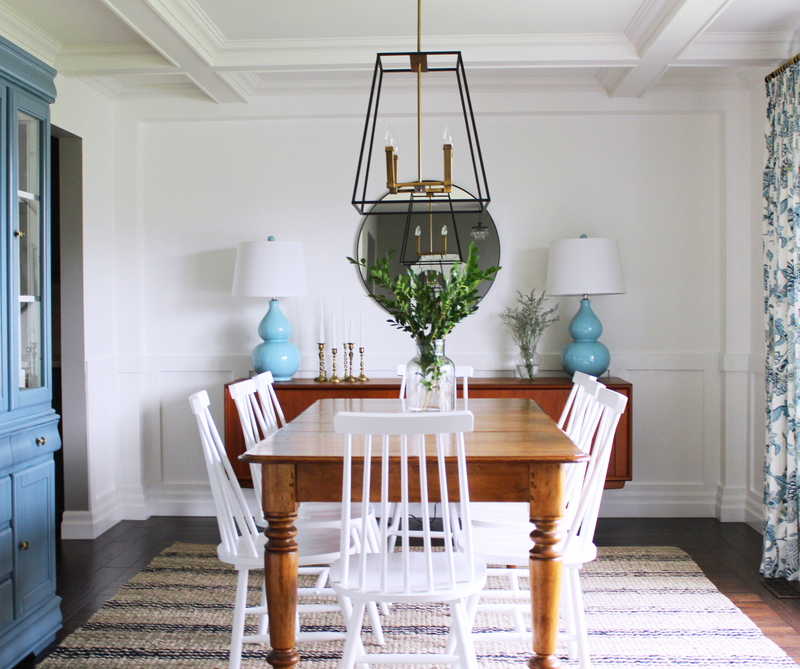 I really loved that chandelier because it came with the house but I was convinced otherwise and I’m happy I made the change! This room is perfect for our family. I knew it needed some colour and need more elements to be an inviting space. The kids like spending time in here which is a good sign! When I bought the table, it had been sitting in the rain so I knew that this was a good table to hold up to little kids! 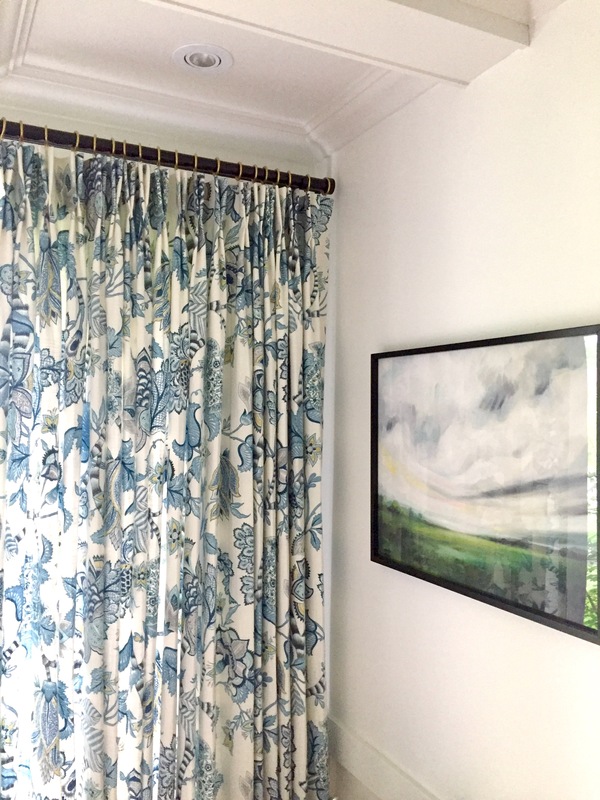 When Tiffany showed me the fabric for the curtains I was so excited, it was the perfect fit for this room. I love that I have a bar cart! I can’t wait to have some parties and set it up for our guests. 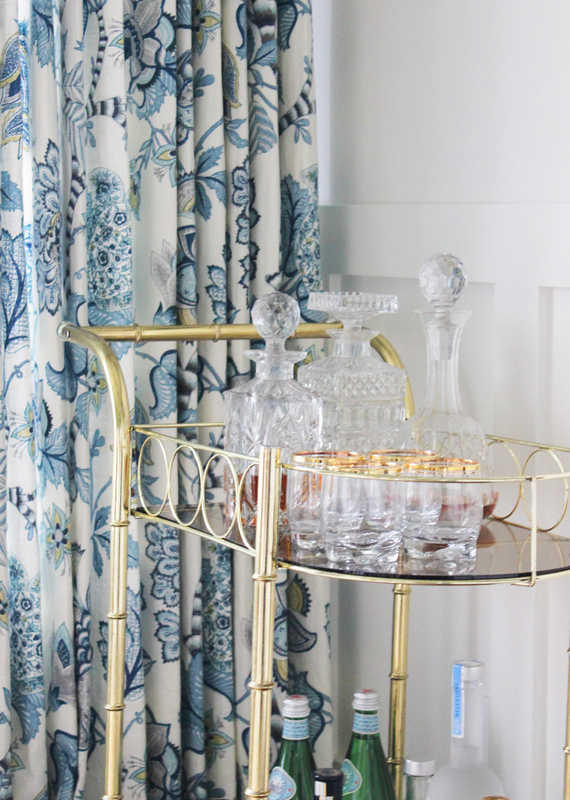 The bar cart is from Etsy, it came from Calgary! I knew I had to have a dining room hutch, my room was big enough to have one and I love displaying little treasures and items from older generations. Tiffany found one on Kijiji and we had it resprayed by Paint It Like New here in the GTA. For more on my great experience with them have a look here. I was truly shocked with the transformation, I know paint makes so many things better but this exceeded my expectations and is a beautiful piece that I know I will love for a long time. Beautiful photographs by Tiffany Leigh. For more information and more pictures click here. 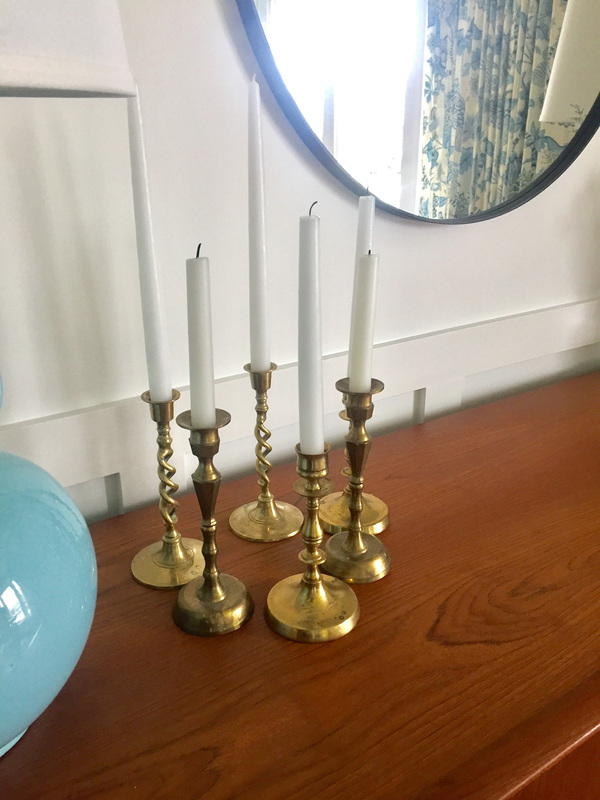 The plates belonged to my grandparents and the brass candlesticks belonged to my other set of grandparents and another pair belonged to my parents. I love having items in the room with a story to tell! 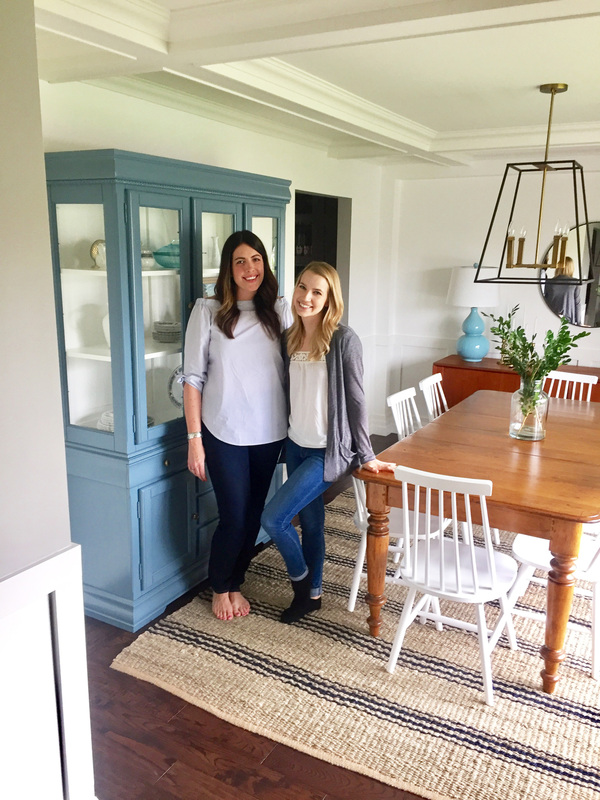 What a heart warming design story Laura.The room looks absolutely gorgeous !